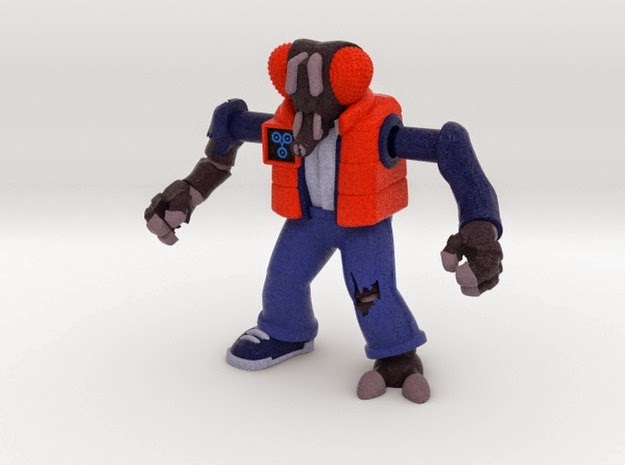 New on Shapeways from Trent Troop, it's Combat Creatures Muty McFly! This parody figure takes the basic format of the Battle Beasts and twists it into another 1980s icon, mixed with another film creature. The full-color sandstone figure is on Shapeways now for $10.73 (cheap) in Beta. The little square icon on the vest is particularly clever, so do check it out. The price is high, but the packaging is interesting - all English, it seems, but supposedly paper-thin. 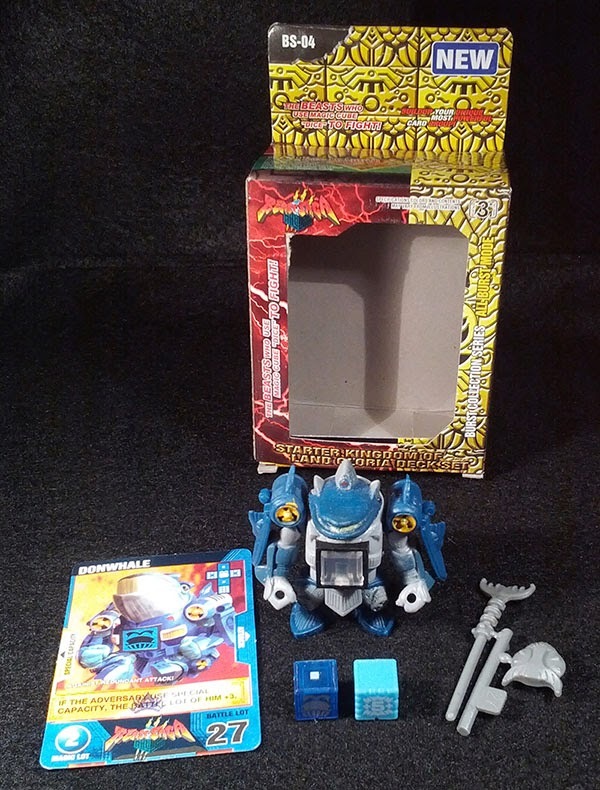 This image was taken from the aforementioned LRG forums, and the one on eBay is a buy-it-now for $21. If anyone has a cheap lead on a set of these, do let me know. 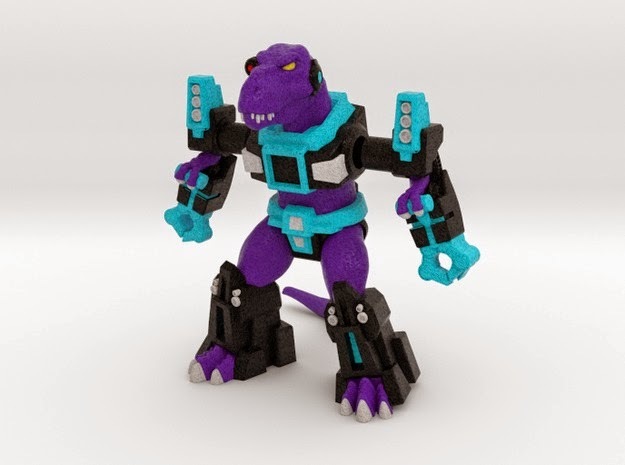 Trent Troop is at it again - Combat Creatures Terrifying Tyrannosaurus is on Shapeways now for $16-$24, depending on which version you snag. 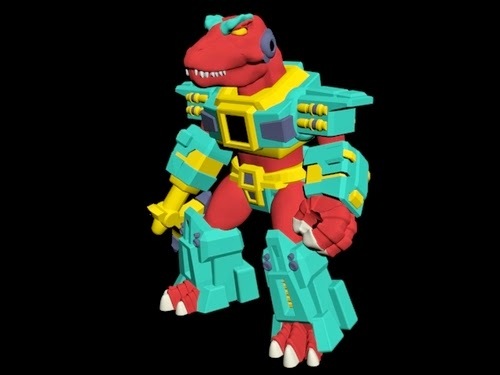 It's a mirror-flipped redeco of Rampaging Rex, so it's not the exact same sculpt... except that it totally is. Manufacturing on demand offers some unique capabilities with a minimal amount of work, and "flipping" a figure is certainly a nice perk! Order yours here. Also, Nick Tyranno on The Allspark forums got Rampaging Rex in Sandstone, and posted some shots - it's worth a look! The Armorvor Neo Phase is the end of an era. Along with the Rig Crew Mimic Armorvor, these two guys round out the final run of wolf-headed Armorvors - the furry head goes into retirement and will be replaced by something new in late October. Until then, these two figures - and a fifth run of the super-popular clear colorless version - seem to be available in the Onell Design store. They're quite nice, and if you never picked up an Armorvor I'd strongly advise you do so now as it really is the last chance to get this head outside eBay. Over two years we've had dozens of the little guy, but this is the first and only clear plastic one to feature painted details. The Infection Red and Stealth clear colorless releases are undecorated. 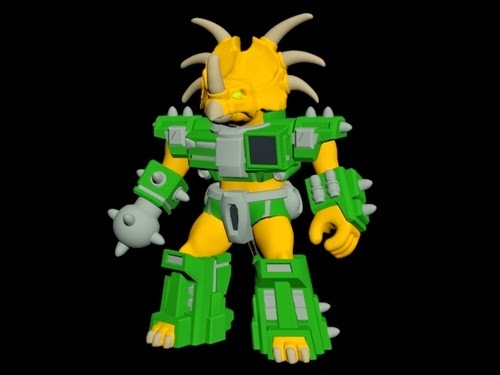 Trent Troop is a busy guy - in addition to BMOG he's apparently sitting on some designs for new Battle Beasts-adjacent figures that he's trying out on Shapeways. Atomic Allosaurus is only on his Tumblr right now, but it's pretty cool. If you liked Dinosaucers you're probably going "Oh, yes, I like this." He has an axe hand and is all sorts of awesome. No release date is known. Joining him is Stalwart Styracosaurus, also only on Tumblr for now. He has a mace hand and is similarly really nifty. 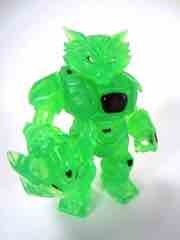 You may know the name "Trent Troop" from various toy projects, including BMOG. I found out he's been busy on Shapeways, and well, look at a beta project he has up there. 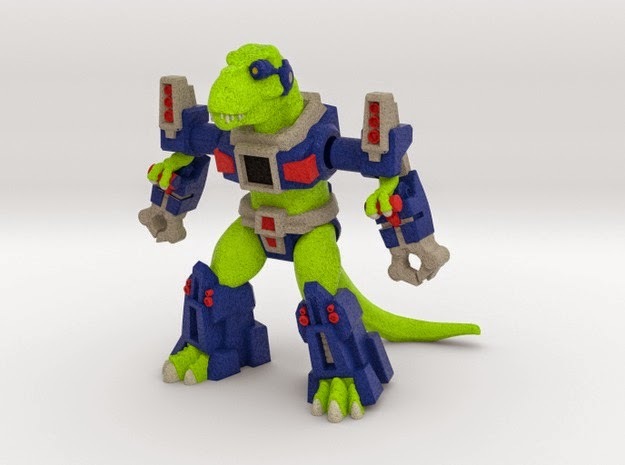 Rampager Rex is, apparently, the result of someone reaching in to my dreams and making something great. 5mm compatible arms means you may be able to plug in various Transformers and BMOG weapons, and the look... just look at it. It's gorgeous. It's in "beta" and it's $10.88 right now. And I don't know if I can go on living without one for much longer.